Susan Hunsinger-Hoff announced her 2019 run for the Hatboro-Horsham School Board at the Ukrainian American Sport Center on Thursday night. As an educator, Susan has worked with public, parochial and independent school teachers throughout her forty-four year. In her capacity as instructional technology specialist, she worked with students, teachers, parents and school boards from preschool to postgraduate level, taught a graduate level course in educational technology, and chaired several pre-k-12 committees on digital citizenship and internet safety. Susan grew up in Horsham and currently resides in Hatboro. The announcement was made at a ‘Candidate Reveal’ event where a slate of local council and school board candidates was unveiled. The event was attended by Democratic Party leaders from Horsham and Montgomery County, as well as numerous elected officials at the state and local level. Susan Hunsinger-Hoff brings many different perspectives, skill sets, and insights to the Hatboro-Horsham School District. She currently serves as the VP in charge of charitable giving for The Woman’s Club of Suburban Philadelphia which raises money for local children’s charities. Current School Board member Jennifer Wilson introduced Susan at the event. “Residents want the Hatboro-Horsham School District to pursue initiatives that benefit our students and use the latest in educational technology and techniques. Susan is well-positioned to help us achieve those goals." Natasha Bagchi announced her 2019 run for Horsham Council at the Ukrainian American Sport Center on Thursday night. A global pharmaceutical marketing executive with twenty years’ experience, Natasha Bagchi has worked with the pharmaceutical company Pfizer and many others, managing multi-million dollar global marketing and product introduction programs. Natasha and her husband Indranil have been Horsham residents for fifteen years and have two children. Natasha Bagchi's signature issue is to make Horsham a more attractive place for residents and businesses. Her local political and advocacy experience includes leading the executive board of the Horsham Chase Residents Association, where she assisted residents in protecting wetlands. She has been strongly advocating for the environment, using the United Nations Association and Friends International as a platform. For more information, or to donate to the campaign, visit http://www.Natasha4Horsham.com. Lisa Cellini announced her 2019 run for Horsham Council at the Ukrainian American Sport Center on Thursday night. Lisa Cellini is a small business owner, a public health nurse, and a clean water advocate. She was recently appointed to the Environmental Advisory Council by Horsham Council. She and her husband Carl have lived in Horsham for twenty years and have three grown children. Lisa Cellini's signature issue is the contamination of Horsham water by chemicals historically used at the Willow Grove Naval Air Station, and the impact of this contamination on the residents of Horsham and on the township as a whole. Lisa Cellini intends to utilize her previous experience as a Public Health leader to assist in arriving at good solutions for delivering clean, fresh water to Horsham while addressing funding for necessary Base clean up, and medical follow up for impacted residents. Cellini is also very interested in expanding Horsham's artistic community and facilities. Increasing support to the arts could improve our business climate and make Horsham a more attractive place to live. Montgomery County Chair Valerie Arkoosh spoke at the launch event and said, "Lisa's long record of leadership and advocacy in Horsham is the change we need on Council. Her background in public health will mean that she will be a leader on many of the issues facing the Horsham community." For more information, or to donate to the campaign, visit http://www.Lisa4Horsham.com. Horsham Democratic Committee is hosting a Candidate Reveal Party and Fundraiser on January 31st at the Ukrainian Sports Club - Tryzub located at 1 Lower State Road at County Line Road. The event will run from 6PM - 9PM. At this event we will be introducing two candidates for Horsham Council, as well as a candidate for Hatboro-Horsham School Board. Valerie Arkoosh and Ken Lawrence, running for re-election as Montgomery County Commissioners, will also be attending. Horsham has two council positions up for election this year. With two Democratic councillors already elected, it is possible to swing Horsham council from red to blue, but we cannot do it without supporting our candidates in the Primary and through the Municipal Election. Tickets are available on our website at HorshamDems.org, or at the door. Please RSVP, purchase tickets, share this event with your friends, and bring as many people as possible. An early show of support will enable our candidates to move forward confidently. Let's fill the room and show them Horsham is behind them. Below is the calendar from the PA Department of State for the 2019 Municipal Elections. The first task will be accomplished at our candidate reveal party on January 31st. We will be asking everyone to come together and help us gather petition signatures for our candidates. Petition period this year is from February 19 to March 12. There will be many opportunities to gather signatures, with door to door canvassing activities as well as organized petition parties. Petition signing activities set us up well for GOTV activities. We will be communicating dates and activities for this soon and look forward to seeing you at our activities and events. If for some reason you cannot participate in our activities, you can still support the Horsham Democratic Committee in our efforts to elect Democratic Candidates. Elections are costly and even a small contribution can make a big difference. Please make a donation today to support our candidates and our efforts to elect them. Join us on February 19th for our Monthly public meeting of the Horsham Democratic Committee. Our agenda includes presentations by candidates for public office, updates by elected officials, and practical information for committee members and guests. This month our keynote presentation is provided by Tomea A. Sippio-Smith, K-12 Policy Director, Public Citizens for Children and Youth, representing Pa Schools Work- A coalition of organizations from across PA representing teachers and other educators; urban, suburban, and rural communities; and parents and other community members working together for advocate for more state funding for K-12 public school education. This campaign builds on the work of the Campaign for Fair Educational Funding, the effort that was instrumental in gaining support for bipartisan enactment to a fair funding formula in 2016. Following the keynote, we will be providing training on how to properly gather petition signatures for candidates who wish to be on the ballot in the upcoming primary election. This gathering will be hosted at the Yuong Sang Presbyterian Church on Witmer Road in Horsham, beginning at 7PM. All of our regular meetings are hosted at the Yuong Sang Presbyterian Church on Witmer Road in Horsham, beginning at 7PM. You can find our complete event listing on Facebook here. 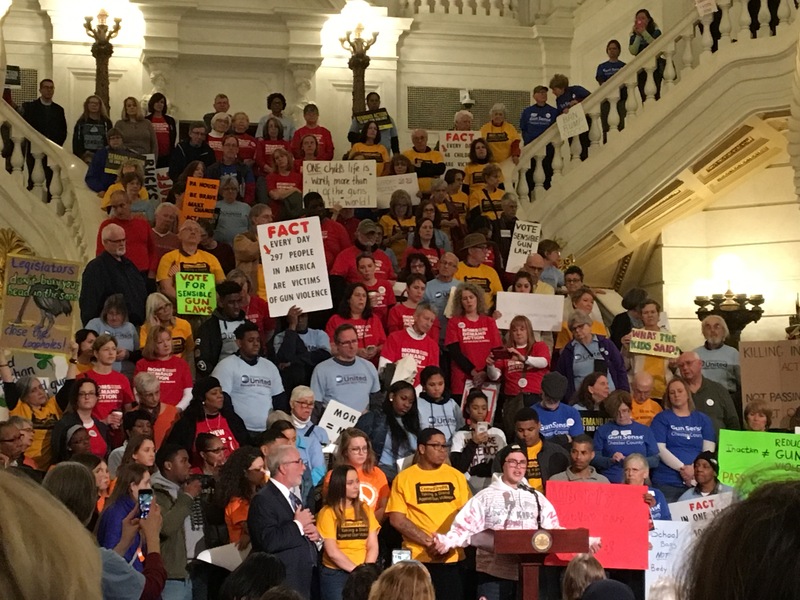 Join CeaseFirePA on January 29th as we rally at the Capitol to remind the General Assembly that gun violence has not taken a break and that citizens across the Commonwealth are ready for legislative action. Follow the link to sign up for a seat on the bus! Caryn Leifer, representing National Nurses United, will be providing an update on the status of proposed legislation by Representative Pramila Jayapal, D Washington, for Medicare 4 all (universal health care) Previously this has been listed as HR676. She has not yet reintroduced the bill and therefore it has no number and not sure of committee assignment as of now. We will also discuss its relationship to ACA. That's all we have for right now. Please forward this to your friends, save the dates, and contact us at info@horshamdems.org if you have questions or would like to volunteer! Save the Date! 2019 Fundraiser and Candidate Reveal! Are you concerned about water quality in Horsham? Would you like to have more direct input into the decisions that are being made that directly affect the health and finances of you and your family? What about the plans to commercially develop areas of Horsham? Have lots of questions you wish you could more directly get answers to? Ever thought, or said, that you could do a better job than the people currently in charge? What if, instead of asking for answers, you could become one of the people with the answers? Wouldn't that be great? Well guess what? You can. mail them or drop them off at the Township Office, currently located at 1025 Horsham Road. The meetings are held at the Authority Building, 617 Horsham Road, on the second and fourth Monday of every month at 7:30 P.M. (215) 672-8011. The Horsham Township Sewer Authority was created in 1963 and comprises seven residents of the Township who are appointed by Council. They are organized under the Municipalities Act of 1945, for the purpose of constructing or otherwise providing the facilities necessary to furnish sewage disposal in Horsham. The authority presently owns one sewage treatment plant. It has entered into various agreements with the Upper Moreland/Hatboro Joint Sewer Authority concerning the sewage treatment in the eastern portion of Horsham. In 1997, the articles of incorporation were amended so as to designate this authority to also provide water to the township. Their commitment enabled the consolidation of the former water authority. The Horsham Watwer and Sewer Authority Board meets on the 2nd & 4th Mon. of each month at 7:30PM at the Water and Sewer Authority offices at 617 Horsham Road. The Industrial and Commercial Development Authority was established in 1977 and consists of residents appointed by Council. They are governed by the provisions of the industrial and commercial development authority laws. The Historical Commission comprises five residents who are appointed by Council. Its purpose is to advise Council in identifying and preserving historical sites, buildings, papers, documents and relics of historical significance to Horsham Township. The Library Board was established in October of 2002 to work with the Township Council to administer the affairs of the free, public, non-sectarian library under the provisions of the Library Code, the Act of June 14, 1961, P.L. 324, (24 P.S. 4401) as amended. The Library Board of Directors meets on an as-needed basis. These positions will be filled in a council meeting soon, so do not wait to apply. This is your opportunity to be a part of the solution. If you have any questions about these positions, what they entail, or how to go about applying, please email us at info@horshamdems.org. Dangerous Case of Donald Trump this Tuesday, GOTV Starts Saturday! How can I help this week? Saturday and Sunday: Help us Get Out The Vote by going door to door to ensure Democratic Voters will come to the polls! Horsham Democratic Committee meetings are held at the Yuong Sang Presbyterian Church on Witmer Road beginning at 7PM. Howard H. Covitz Ph.D. A.B.P.P. 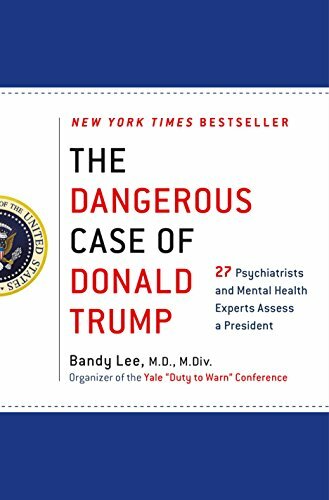 is a contributor to the bestselling book "The Dangerous Case of Donald Trump: 27 Psychiatrists and Mental Health Experts Assess a President" (Amazon link: https://www.amazon.com/Dangerous-Case-Donald-Trump-Psychiatrists-ebook/dp/B07262SJDC/ref=sr_1_1?s=books&ie=UTF8&qid=1533522789&sr=1-1). All of our meetings are now posted on our Facebook Page. Please RSVP, like, and share them with your friends! It's Crunch Time for Getting Out the Vote! Starting next weekend, October 20 and 21 all the campaigns pivot from identifying supporters to getting them to actually get put and vote on Election Day, Tuesday, November 6. This means that the number of difficult encounters will go way down and the number of people glad to see us will go way up. Because Horsham lies in two Congressional districts, there will be two staging locations for GOTV starting October 20 and every Saturday and Sunday through Election Day and on Monday and Tuesday, November 5& 6. CD 1 : 105 Potters Way, North Wales. It is a private home in a development sitting on Horsham Road near Rt. 152. Pretty close to Horsham. It is important that we cover the 4th ward and precincts 2-1 and 2-3 to get folks out to vote for Scott Wallace as well as Sara and Maria, Tom wolf and Bob Casey. You can pick up walk sheets, and get training and paired up, if you want to, on Saturday at 10, noon, 2 or 4, and on Sunday at noon, 2 or 4. For those that can’t go door to door, come to campaign headquarters and make GOTV phone calls. Wednesday, October 17, from 4-7, there will be phone banking to reach Democrats who requested absentee ballots to remind them to mail the ballots in so they can be counted. The races for state legislature and for Congress in the 1st CD will be close, so it’s crucial that all absentee ballots get returned. If you have an hour on Wednesday evening, come on down to campaign headquarters at 714 N. Bethlehem Pike and make some calls! Donations are welcome via our website at https://horshamdems.nationbuilder.com/donate. Money donated now will be used to help elect Democratic Candidates in the elections this fall, and in the Township and School Board elections in 2019. On Election Day when people go their polls to vote, they may need help or have questions about where to go or who the Democratic candidates are they should vote for. To help these voters the Horsham Democratic Committee organizes Poll Greeters who welcome voters at the polling locations and make sure any questions they have are answered. This is where you come in: we need people to perform this important task. A polling shift can be as short as one hour, and any amount of time spent on this activity is an investment in our democracy. This is a kid-friendly activity, and young people are encouraged to participate in this role. If you have an hour or more on Election day, and care enough about the outcome of the election to help people at the polls, please call Caryn Leifer at (609) 519-8255. Will YOU be a Candidate for School Board or Town Council? The 2019 Municipal and School Board elections are a little more than 14 months away. If you are thinking of running, or know someone who would be a good candidate, now is the time to come forward and begin to prepare. Campaigns will kick off shortly after the November Mid-Term election. There has never been a better time to run for office in Horsham. Will you make a difference? The next Township Council Meeting is October 22nd. The next Parks and Recreation Meeting is October 16. The next Zoning Board meeting is tomorrow November 13. The next Environmental Advisory Committee Meeting is Oct. 23rd. All Township meetings are currently being held at the Library on Babylon Road. Check our Facebook Events page for times. Save the Date for the MCDC Annual Fall Dinner - Sunday, October 21, 2018! Do you know someone who may be interested in helping us elect Democratic candidates? Please forward this email to them, or have them visit our website at http://www.horshamdems.org/help_out to opt in to our emails and get more involved. Susan Glover, President of the Horsham chapter of the Society of Saint Vincent de Paul, will attend our meeting and discuss the needs of Horsham residents and the programs which are offered by the society to help address these needs. The executive committee will be meeting through the summer every Sunday am at 8am, at Peggy Leiby's barn, which is located at 524 Cedar Hill Road. Executive Committee meetings are where we plan events, coordinate activities, and set the direction for the committee. We never have enough people to do all that needs to be done, so all are welcome to attend. Today: Check your voter registration and make sure it is current. Also today: Call your friends and ask them if they are registered to vote. Help them to register if help is needed. Friends don't let friends forget to register to vote. Wednesday, October 10, 4-9 PM: Quality Control on postcards. All the post cards have been written. Now we have to review them to make sure they are ready to go. Saturday-Sunday, October 13-14, 10:00 AM - 4:00 PM: Canvass for Sara, Maria and the entire Democratic ticket. Enjoy the fall weather and knock on doors for our candidates. An invitation to an event that Orange Wave - Vote for Gun Safety is hosting next week. We are co-hosting, Fred Guttenberg, who lost his daughter Jaime during the mass shooting at Marjory Stoneman Douglass. Fred will speak about the importance of voting for gun safety candidates and for pushing our legislators to take action on gun violence prevention. He will be joined by a few students from MSD high school as well as students from Bucks County Students Demand Action. I hope that you will be able to join us! Please RSVP here if you can join us. Tickets are free but required. It was a full house on Sunday morning as Democrats came to canvass with Maria and Sara with backing from the League of Conservation Voters. As we get closer to Election day the numbers of people coming to help out continue to grow. The next Township Council Meeting is this Wednesday, Oct 10. The next Township Planning Commission Meeting is October 2nd. The next Zoning Board meeting is tomorrow October 9th. Sunday, October 14 (1-3pm) Conshohocken Fundraiser Women in the House (and Senate). Address provided upon RSVP. Please join Turn PA Blue and Rep. Mary Jo Daleyin supporting three amazing Montco candidates: Maria Collett (SD 10), Liz Hanbidge (HD 61), Sara Johnson Rothman (HD 150). You can purchase tickets here. The State Board of Education is conducting round table sessions for the public that will be used by the board to help identify issues of concern and hear perspectives. Wednesday, October 10, 4-9 PM: Quality Control on postcards. All the post cards have been written. Now we have to review them to make sure they are ready to go. Come to Campaign Headquarter, 714 N. Bethlehem Pike, 19002 and help us review cards to be sure they are legible, mention the correct candidate, etc. Tonight at 7PM: Go to the Horsham library and get an update on the water situation. The September meeting of the Horsham Democratic Committee was held at the Yuong Sang Presbyterian Church on Witmer Road beginning at 7PM. Our keynote speaker this month was Kyle Bagenstose, an environmental reporter on The Intelligencer's investigative team. He also writes for the Bucks County Courier Times and covers environmental issues in Bucks and eastern Montgomery Counties. For the past two years he has extensively covered major drinking water contamination along the BuxMont border stemming from the use of firefighting foams at area military bases. Kyle provided the Committee with an update on what is known about the sources of water pollution on the bases, why the process of beginning a cleanup is taking so long, and the multiple areas investigative focus he will be maintaining over the coming months. Horsham Council receives regular updates on the quality of water in Horsham. The next update is TONIGHT at the Horsham Council meeting at 7PM. An update on the water issue is the major item on the agenda. Also attending the meeting was Scott Wallace, the Democratic candidate in the 1st Congressional District. Scott spoke about his roots in Bucks County, the national importance of the race for the 1st Congressional District, and made sure to ask everyone for their support. Horsham Democratic Committee endorses Scott Wallace and encourages you to actively support his candidacy through volunteer efforts, and by voting for him on election day. This meeting is basically a water update and all are encouraged to attend. The next Zoning Board meeting is October 9th. Join the Upper Dublin Democratic Committee in conjunction with State Representative Candidates Sara Johnson Rothman, Daryl Boling, and Ben Sanchez to announce that they are bringing #IntelligentLives to AMC 309 Cinemas in North Wales, PA on October 1, 2018. The screening will begin at 7:30 pm and will be followed by a discussion with the candidates and guests from the intellectual disability advocacy community. Seating is limited; please reserve your tickets at bit.ly/2xymXkz today! Proceeds to benefit efforts that support local young people with intellectual and developmental disabilities to achieve their full potential. -Dan Habib, Producer & Director of the new thought-provoking documentary INTELLIGENT LIVES. This film is opening doors as it captures an emerging paradigm in which people who have accessed supports can successfully participate in general education, college, integrated employment, and relationships. Come help get ready for the weekend's canvassing, write postcards, help out in other ways.